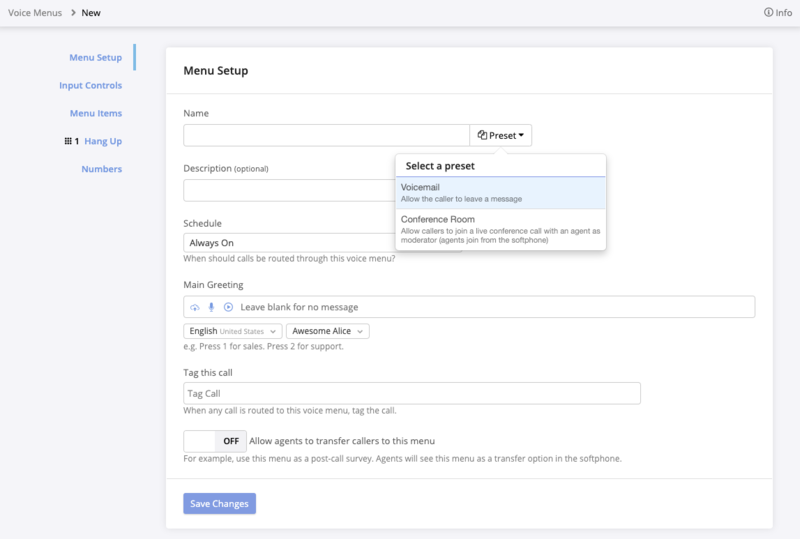 Although voicemail in CTM is created in a voice menu, this page only covers voice menu settings that are relevant to setting up a voicemail box. For more information on voice menu settings, see the full article here. Navigate to Numbers → Voice Menus. If you do not have a voice menu in your account, you’ll be directed to a new setup page. Otherwise, click New Voice Menu in the upper right corner. Click the Preset dropdown (located next to the Name field) and select the Voicemail preset. Messages will be recorded, but not transcribed. If you wish to customize your voicemail box, you can now edit the voicemail box name, description, greeting message, and recording options. See Customizing Your Voicemail below for more information on these settings. Although the “Leave Message” option is associated with keypress 1, the preset’s settings allow callers to leave a message without making a keypress. 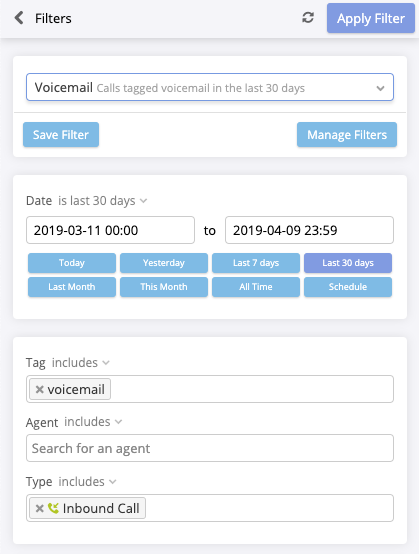 In this section, you can edit the name and description of your voicemail box, customize the greeting message, and choose to automatically apply tags to calls that are routed here. The greeting will play before the beep that lets callers know it’s time to leave a message. Make sure to include any important information you need to convey before your caller leaves a voicemail for you. For help setting up your greeting message, see this article. 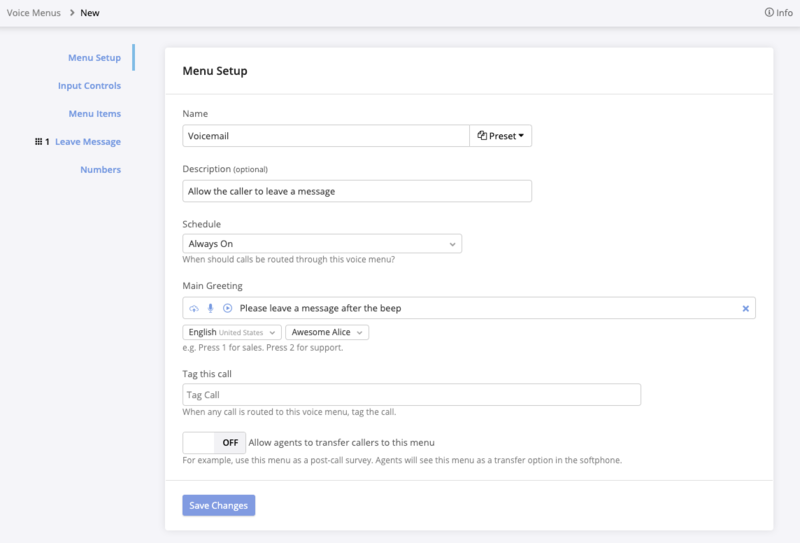 Using the “Tag this call” field, you can set up to three tags that will be applied when a caller is routed to this menu. Tagging calls with “voicemail” will make it easy to find and report on these calls later. This section allows you to fine-tune how callers interact with a voice menu. While you can edit these settings on a voicemail box, it is strongly recommended not to make any changes here. See the full article on voice menus for more information about this section. In the Menu Items section, you can customize recording settings for voicemail messages. 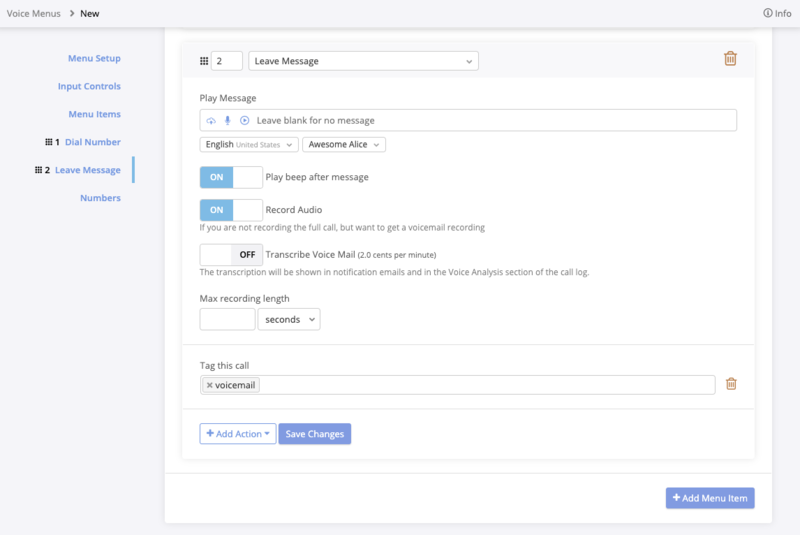 Although there is a “Play Message” field here, it is not needed for a voicemail box that already has a greeting configured in the Menu Setup section. If you set up a greeting and also add a message on the menu item, the two messages will play back-to-back before the caller leaves a message. You can use the toggles to enable or disable the beep that plays to prompt the caller, recorded audio, and transcriptions. Use the “Max recording length” field to specify the maximum duration allowed for voicemail messages. By default, a beep is played for the caller, recordings are on, transcriptions are off, and the max recording length is one minute. If you have a voice menu you are using to route callers to different parties, you can add a voicemail option to that menu rather than configuring a separate voicemail box. When adding a voicemail option, make sure that the greeting at the start of the voice menu includes the keypress callers should use to leave a message. Navigate to Numbers → Voice Menus and click edit next to the menu you want to update. Click or scroll to the Menu Items section, then click +Add Menu Item. Use the drop-down menu to select Leave Message. By default, the keypress for this option will be the next available number that hasn’t been used in this menu. If needed, you can change the number to another digit that hasn’t been used. To play a beep to the caller (letting them know to begin leaving a message), click the Play beep after message toggle. Click Record Audio to enable recordings for the voicemail message. If you wish to enable transcriptions for voicemail, click Transcribe Voicemail. Set the maximum recording length that will be allowed for voicemail messages. By default, there is no limit. To make it easier to find and report on your voicemail messages, you may wish to apply a tag to calls where the caller selects this option. To apply a tag, click +Add Action and select Tag Call. Enter a tag in the field (such as “voicemail”). Creating a voicemail box is only the first step to using CTM voicemail. In order for callers to be able to use your voicemail, you have to make sure calls are routed to the voicemail box. Typically, this is done through no answer routing options, but you can also route tracking number directly to voicemail. 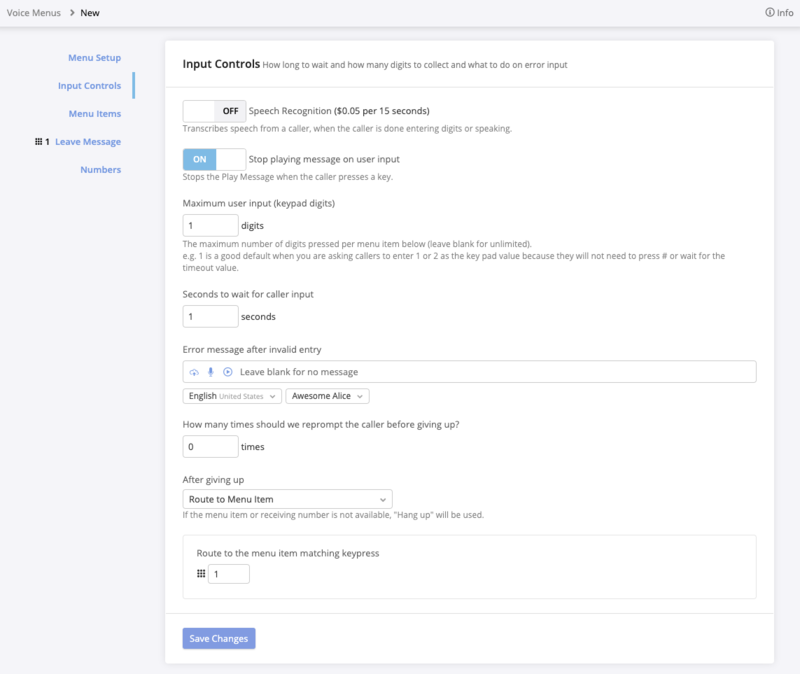 Setting up a notification that will automatically email you when a voicemail is received. To pull up calls that went to voicemail while you’re in your CTM account, navigate to your call log and use the filter button to show only calls that are tagged “voicemail” (or the tag that you have applied to your voicemail box). You may want to save a filter to make it easier to pull up these calls in the future. You can have voicemail messages automatically emailed to you by using notifications. For more information about creating notifications, see the full article here. Navigate to Reporting → Notifications. If you don’t already have a notification in your account, you’ll be directed to a settings page for a new one. Otherwise, click New Notification in the upper right corner. Enter a name and optional description for the notification. Use the Type drop-down to select when the notification should be sent. The default is “After Call/Text/Form,” which will send you a notification whenever someone leaves a voicemail message. For this setup, you may also want to use Hourly or Daily Digests. In the Recipients field, enter the email addresses for everyone who should receive this notification. In the Email Data Fields section, make sure all the fields you’d like to have included in the notification appear in the list on the right. To adjust what is included, click the names of the fields to move them between lists. Transcriptions are not included by default in notifications. If you are transcribing voicemails, you might want to include this in your notification. 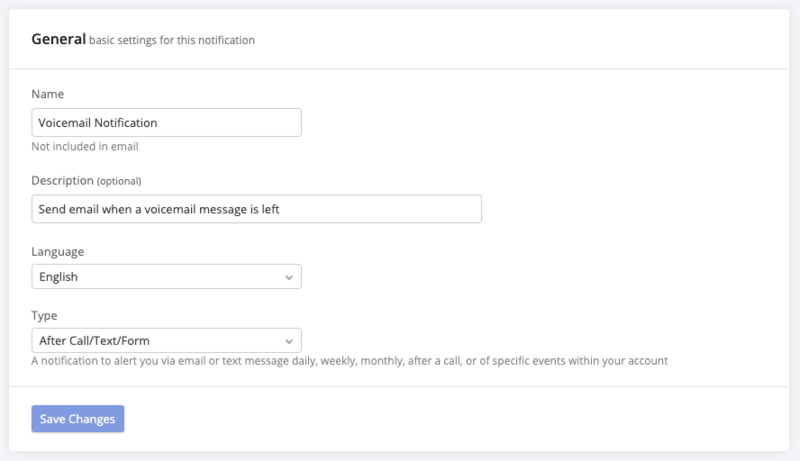 In the Filters section, you will create the rules for which calls should be included in your notification. For this setup, you’ll want to make sure you are tagging your voicemail calls. Click +Add Rule to create a new rule, then use the drop-down menu to select Tags. In the field on the right, select the tag that you are applying to your voicemail calls. 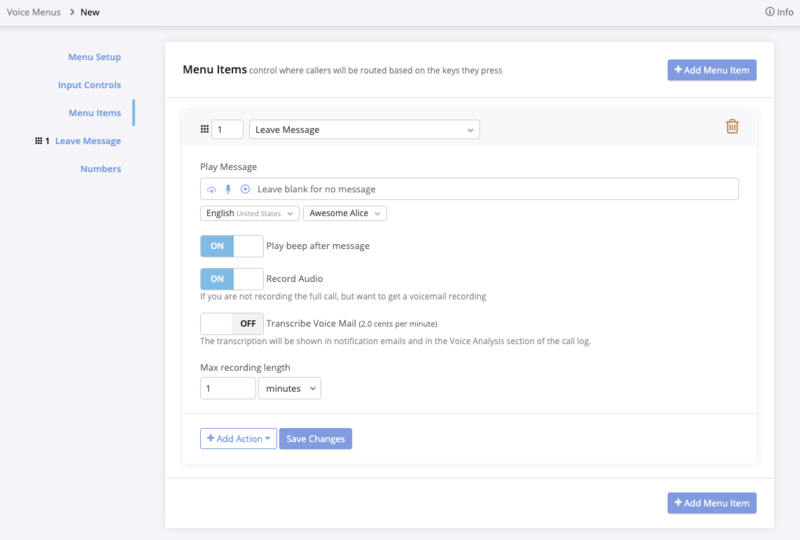 You can add more rules to further refine which voicemail calls will be sent to you. For example, you might want to specify that only voicemail calls with at least 5 seconds of talk time can be included in the notification.